The theme of turbirovanie diesel engines is one of the most interesting to explore. Apart in this direction is the sector of the development and application of engine with dual turbochargers. Internal combustion engines and diesel power units are driven by energy released during the combustion of the fuel-air mixture. If the fuel pump may only be fuel pump, methods of air sampling there are several. Naturally aspirated engines, characterized by the simplicity of the device, receives air from the environment under the action of the natural vacuum that is formed in the carburetor. However, they have a significant disadvantage, expressed in low power, which is completely eliminated in Peterborough and turbocharged engines. The principle of forced air injection into the combustion chamber of the diesel engine was known in the late nineteenth century, however, the patent for the turbocharger Alfred Büchi received only in 1911. 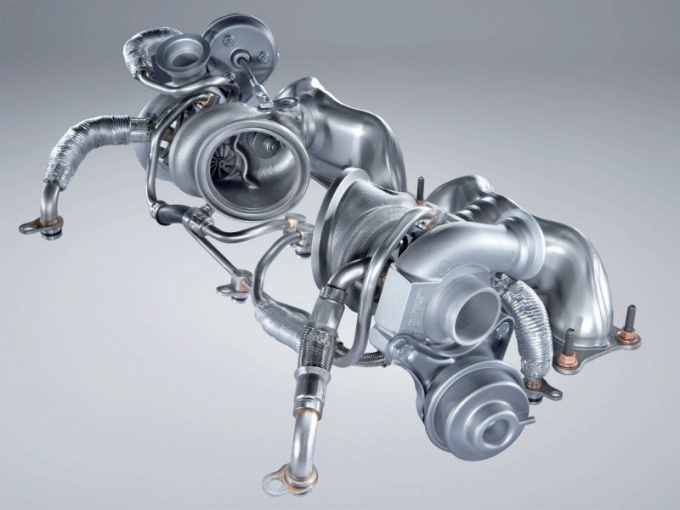 The invention of turboaggregates was one of the results of a study of methods of increasing power a diesel engine, of which the most promising was thought the principle of forced injection of the combustion chamber pre-compressed air. Excess air in the combustion chamber allowed to burn up to 99% of the fuel mixture, which provided turbirovanie the engine for increased power without significant compromise in efficiency. The principle of operation of the turbocharger based on the use of energy of exhaust gases. Gas from the exhaust manifold under high pressure passes through the turbine, spinning it. The turbine shaft has a direct connection with the rotor of the centrifugal compressor producing air to the intake manifold. The performance of the turbocharger depends on the power of the engine. In today's automotive industry more and more attention is paid to dynamic characteristics of vehicles. Sometimes even the advantages of turbocharged engines before atmospheric be less pronounced. The fact that the demand in the presence of oxygen in the combustion chamber has a linear dependence on the growth of torque. Simply put, there is a threshold power beyond which the performance of the turbocharger is insufficient for the full potential of the diesel engine. This disadvantage was eliminated with the appearance of the engine with dual turbocharger. When the engine goes beyond the performance threshold of the compressor is the inclusion of the second turbocharger. It has higher performance, which in turn, too high to operate the power unit at low speed. Design Biturbo engine allows you to realize increased power by burning more fuel, instead of extending the volume of the working area of the cylinder.